A powerful hypnosis program to overcome negativity, malaise, depression & essentially become happier! This CD Is Created As A Stand Alone Program And It Is Also A Perfect Compliment For Every Other Program. This Gold Record (ARIA) accredited Personal Hypnotherapy Program is designed to help you safely let go of depressive thoughts & feelings and overcome low self esteem and general anxiety. You can rapidly regain your self confidence, personal happiness and self esteem safely and naturally with this powerful self hypnosis program! Depression, panic attacks, sleep problems and numerous other emotional afflictions can become a thing of the past. The beneficial suggestions on this CD/MP3 will guide you forward to re-learning and discovering your own abundant talents and potential that may have been latent for many years! All positive personal change can only happen if you want it to happen – choose to be positive rather than negative and embrace all the good things that can happen in your life. Go out and enjoy life more! Just did Happiness and Self-Esteem for the first time. Fantastic, thank you very much. I wish everybody would do these! Thanks for the early response..I started with self-esteem and abundance cds together in the night time and in a repeat mode and its working very well for me,because its just 2 nights of listening and 1 unexpected oppurtunity opened up and if everything goes well,I will recieve an amount equal to 1000 US Dollars within 10-15 days..This raised my hope abt these CDs that they will definitely improve my financial situation to the better..Please and please convey my gratitude to Rick for producing such awesome CDs...Also,from yesterday onwards I am feeling very frustrated,angry and hopeless about my finances and these feelings are extremely heavy on me and taxing too..But I believe that all these feelings are a part of cleansing mechanism happening within my subconscious mind regarding abundace and FINANCES..Can this be so..And how best can I deal with these emotions in a positive way..Thanks,Rajesh. Absolutely brilliant. I have been diagnosed as a manic depressive for many years. Since August my life has completely changed by listening to Dr Collingwoods Happiness And Self Esteem CD. I have lost 23 kilos of excess fat, I have completely quit 18 years of smoking 25 cigarettes a day ( 14 weeks now ) and I feel happy and balanced. I thank you eternally Dr Collingwood, you have given me my life back. I am just writing to request my free hypnosis CDs from Rick’s show at Osborne last week. My fiance’ and I were both there. Can we please get the super memory and super sports performance CDs, as i’m sure Rick said it was one CD per person. Please address them to: [address] . Recently I bought one of your CDs and just after 2 days listening already can see a lot of positive changes. Those fast results impressed me so much that I’m thinking to become a hypnotherapist. Are you planning to do your course training in Melbourne in near future and if not could you please direct me or recommend a good hypnotherapy course in Melbourne. Dental Fear Central has received some negative feedback about the dental phobia download from hypnosisdownloads.com, so you might want to save your money on that one. Apparently, it’s very generalized and does nothing to deal with your specific fears. 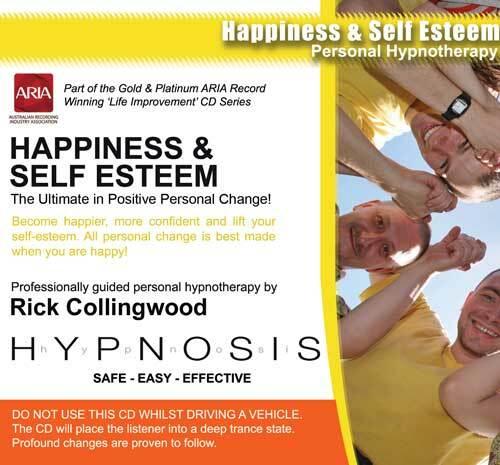 One hypnosis CD series which has been highly recommended is by Dr. Rick Collingwood, e. g. “Happiness and Self-Esteem”. Search for Rick Collingwood on amazon.com, and it’ll come up. He’s Australian, so if you don’t like Ozzie accents, you may be out of luck. If you’ve tried any other hypnosis CDs you’d like to recommend (or warn people about), e-mail connect@dentalfearcentral.com! Hi I have been using the life improvement cd for a few months now and its great, it took a while for it to sink into my brain but I am still actively using it at night when I go to bed. What I want to know is do you have hypnosis cd’s for learning new languages, I would love to learn Italian and I heard from someone that hypnosis might help, well it cant hurt anyhow. I have two of your CD’s and have been using the Happiness and Self-Esteem for the past five days and have already noticed a huge difference. I have suffered from severe depression, chronic migraines and panic attacks for 10 years and today because of your CD’s I was even motivated to do the gardening(rather pull out weeds!) and THAT has never happened!! The question is am I able to use two CD’s on the same day and am I able to use one straight after the other or would you suggest one in the morning and one at night?? P.S. My two sons aged 7 and 4 also thank you for giving them a happy mummy…..one that they have never seen before!! It has been about six months since I first started to feel not quite right. I did not know what was wrong just thought my body was mucking up. As a result of the anxiety I was suffering, my digestive system started to shut down. Then I started to worry about that also. I also suffered depression for a short while. As a result I had considerable weight loss, and started several treatment options. I underwent treatment from my Naturopath also started acupuncture. These treatments helped but the problem still remained. In November I was having a really hard time. My wife I went to see our local doctor who we trust. He is excellent and tells it how it is. Sometimes it is a bit hard to accept what he is saying, but it is better to be told the truth. He told me that stress was at fault and wanted me to start anti-depressants. At first I could not accept it was stress doing this to me, but after a while it made sense and I accepted it. I am not fond of drugs and wanted to avoid them, so we made a trip to our naturopath for some alternatives. The supplements suggested by our Naturopath worked well, however the root of the problem was still there. My acupuncturist suggested that I should get myself a meditation CD, to help me to relax. This is when I discovered the hypnosis CD’s in the shop. They came highly recommended and I was told they were better than meditation alone. So I thought what do I have to lose and bought the self-esteem happiness CD. After the first day (I listened to the CD three times that day) I knew positive changes were taking place. It has been about 5 weeks of listening to the CD now I can feel myself becoming more relaxed everyday living life with a clear mind. I am no longer weighed down by negative thoughts worrying about things unnecessarily. I now understand that I control my thoughts they only have the power that I give them. I still have treatment from our Naturopath Acupuncturist, they work well with your CD. I am now putting on weight again, and am feeling a lot better. I have had a few challenging situations arise, and have noticed the changes in those situations within myself, and can see other people in a different light. I have also had the pleasure of speaking to you on a couple of occasions, and found you to be very understanding of my situation. I didn’t expect that I would be able to talk to you, but was very pleasantly surprised when you took the time to speak to me. It is good to see in this day and age that there are still genuine caring people out there. I firstly would like to say thanks I’ve been using your cds for six months and can notice the changes in me already (Vol 5) i’ve just purchased the weight loss one and have 2 others. I would like to know if you can use two at a time ie one in morning and one in the evening. I would also like to know if it is ok to use with children i have a nine year old who is very bright but has low self esteem and i feel he would benefit from Vol 5 Happiness and self esteem. he has problems sleeping and currently uses relaxation music and herbal relaxing tablets But he still has the attitude that he can’t do things and is useless. He gets this from me and i would like to help him before he becomes a teenager. When i was 19 i was diagnosed with severe panic/anxiety attacks, depression and agoraphobia. I am now 27 and have spent the entire time from the age of 19 up until now trying to heal myself, I have tried just about every therapy that’s available from cranial sacral, psychologists, psychiatrists, metaphysical counseling, reiki, chakra balancing just to name a few the list just keeps going on. But none seemed to work, so as i continued On and through out my quest for healing i would find myself resorting to dope and alcoholism to subdue my frustrations of why i could not heal. but i was really just fooling myself ending up in worse places than where i had started from, meaning i was at deaths door so to speak. But recently several weeks ago I came across dr rick Collingwood’s cd on happiness and self esteem, well the only words at my disposition right now are ABSOLUTELY BRILLIANT no crap. This cd has almost completely healed all of my previously explained mental and emotional dilemmas and is now starting to heal my physical problems that are obviously a bi product of all the previously entrenched negative mental and emotional attitudes that i had from my original diagnoses. now i can actually live a life and make positive choices on daily bases that inevitably lead to even greater prospects for my flutter. I really can not thank rick enough i am literally mind boggled as to how one cd can change my life so dramatically and quickly Thank you. One day I went and put the Happiness & Self Esteem cd on in the bedroom where my husband was sleeping. He woke up that Saturday singing. It was unbelievable. Normally he wakes up on Saturday morning complaining about the kids and the noise and that he’s still tired from the week, but he woke up singing and happy and the cd continues to bring positive change.